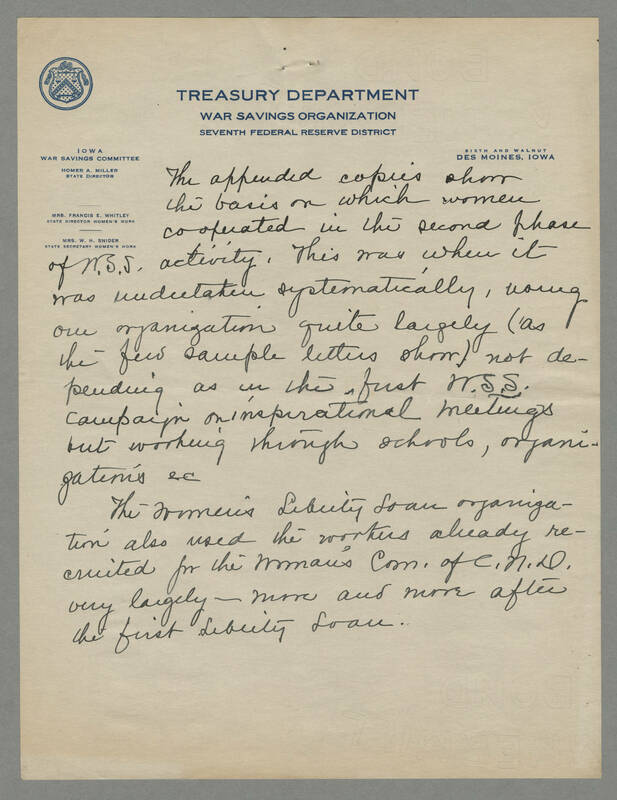 TREASURY DEPARTMENT War Savings Organization Seventh Federal Reserve District Des Moines, Iowa The appended copies show the basis on which women cooperated in the second phase of W.S.S. activity. This was when it was undertaken systematically, using one organization quite largely (as the few sample letters show) not depending as in the first W.S.S. campaign on inspirational meetings out working through schools, organizations, &c The Women's Liberty Loan organization also used the workers already recruited for the Women's Com. of C.N.D. very largely -- more and more after the first Liberty Loan.